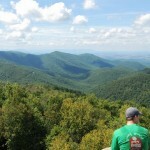 Yesterday Kristy and I went on a hike with first year Darden students. This hike was organized by a second year student and about 20 first year students participated. I’ve included a group photo below. 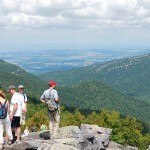 Our group met at 10am on the Darden grounds and then carpooled to the trail head off Skyline Drive. The hike to the Blackrock summit took about an hour. We then spent another hour at the summit on a rock scramble and completed a short loop hike before heading back down to our cars. The total trip took about 5 hours during which we got some good exercise and nice views of Virginia. We also kept to our plan of completing an outdoor hike every weekend. 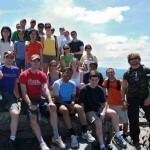 This hike was one of many optional events planned for first year students during orientation week. Another group of second year students organized a community service event for the same time on Saturday morning and 20 first year students showed up to help. Saturday evening there was a Darden Community picnic for all students, faculty, and staff. Kristy and I had fun catching up with our friends at the picnic and watching a performance by the Darden faculty band (BluesJam). Fun! Isn't it beautiful up there? I went hiking for the first time in years this summer and I loved it.